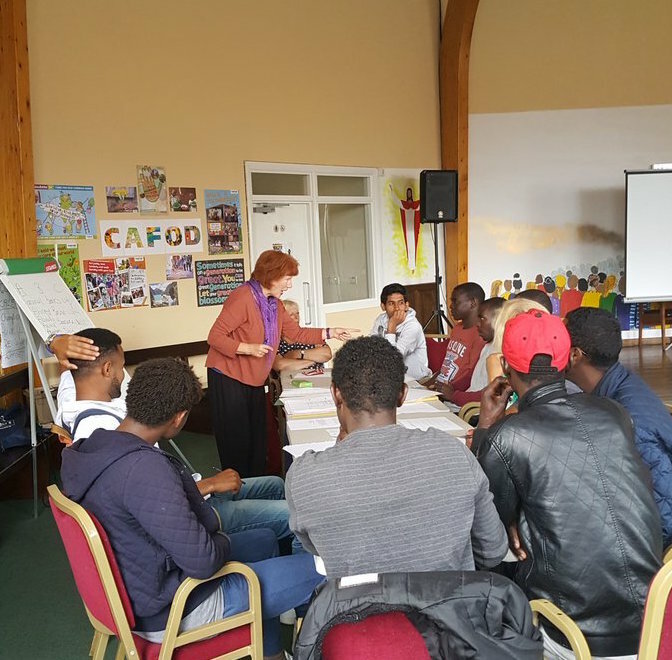 Sunday 23rd April is World English Language Day, so it’s fitting that we talk about the work that we do to help asylum seekers and refugees with communication. Each Wednesday a team of ESOL volunteers led by two specialist teachers offer English Language classes at the Salford Centre. Anyone who is attending for advice or social time can come through to the hall and join us for lessons. We’re open to everyone – they do not have to be assessed or attend for a set number of weeks, so the lessons are informal and responsive to the group. Why is learning English important for refugees? Naturally when moving to a new country it’s important to be able to communicate with everyone around you to integrate into the community – inability to do so can lead to isolation, depression and stress. Many refugees and asylum seekers have been through intense trauma and immense stress before they arrive in the UK – part of our work at Revive is ensuring that they can begin to live more peacefully and comfortably. Learning English is an important starting point – enabling asylum seekers and refugees to make new friends and navigate their new environment more easily, obtaining access to vital services and support. English is also an essential requirement for future employment, so learning the language can have far-reaching positive implications. What is learning English at Revive all about? We aim to increase basic vocabulary and understanding with informal, inclusive sessions designed to help individuals of all abilities to learn and have fun in the process. We ensure that there is thorough revision every week – making learning easier and more accessible. Occasionally individuals have not attended school or were illiterate in their own countries – and this brings additional challenges. It is even more important that they feel comfortable in the learning environment. We cover the most essential areas including days and dates, how to ask a question, the weather, telling the time, buying food, speaking to a doctor and more. Increasing confidence is also crucial because many of the English language sounds are so different from their own – and regular practice is important. Students enjoy the classes because they are actively involved in activities, including games and role play to increase understanding and conversation. Our sessions aren’t scary or serious – instead we make learning English fun – there’s always plenty to talk about, and we laugh a lot! Although the English alphabet is new to many in our group and they are joining us with few words, they are not easily disheartened. They are enthusiastic learners and see this as crucial to their new life in this country. One young man told us he went to coffee bars in the city centre to listen to conversation and increase his understanding. We signpost students to social situations offered by other refugee organisations and have accompanied students to a conversation club, hoping that they may attend independently. We assist in registering them for language courses at Salford and other colleges – this gives them 4 days of lessons each week and helps enormously with them achieving competent language skills. Their progress in just a few months can be astounding – but then many are already fluent in a number of other languages! On a few occasions we have taken the group out, with visits to local tourist attractions including Salford Art Gallery and the Football Museum. This increases opportunities for conversation and familiarises them with public transport. None of the group had visited an art gallery before and their marvel at the beauty of the art and sculpture was quite moving. It also created unexpected opportunities for reflection as a group gather around a seascape and shared their recent terrifying experiences. We teach in an environment that isn’t ideal with limited time and resources – but the contribution is much appreciated by asylum seekers and refugees and is an essential part of the Revive service in supporting their needs. Would you like to support Revive through volunteering or donation? Get in touch today to learn more about how you can help.